Choosing a right tent can prevent you to get wet and cold or keep the bugs off for you and your family while sleeping outside in the dark night. Enkeeo's 2-person dome tent is large and reliable to stay as home, making your sleeping in a tent experience much more enjoyable. Lightweight and compact enough to store in a carrying bag, waterproof and anti-tear polyester, moistureproof polyethylene, shock-corded fiberglass pole frame, windproof ropes and stakes make our tent last long. Meanwhile, a top mesh window allows the inner air more breathable and comfortable, the outer curtain can roll up to increase ventilation and convenient zip enables to instantly open for easily entry/exit. 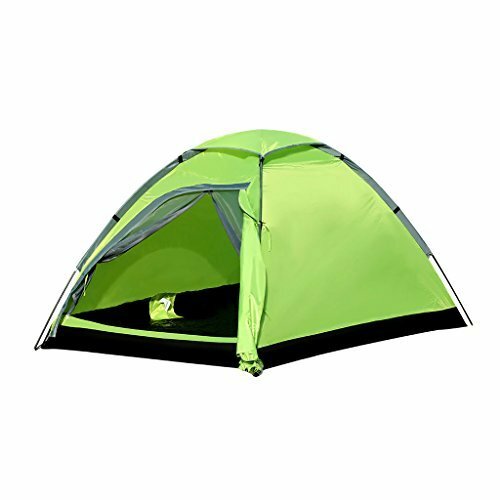 Setting up a tent shouldn't be a hassle when you are camping or sleeping outside at nights. Our 2-person tent features the 2 simple pole design with 4 fixed ropes and 10 tent stakes for easy and fast setting up and taking down during usage. If you have any questions about this product by ENKEEO, contact us by completing and submitting the form below. If you are looking for a specif part number, please include it with your message.